Monday, September 10, 2018 - This guy was caught on camera attempting to break into a parked car but it didn’t go according to plan. 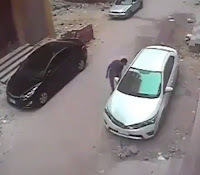 From the CCTV footage, the idiot tried to smash the car window using a giant boulder but it wasn’t an ordinary car window. The rock bounced off the car and nearly crashed his head. This is one of the classic cases of instant karma.